For most people, dancing on the floor is challenge enough. 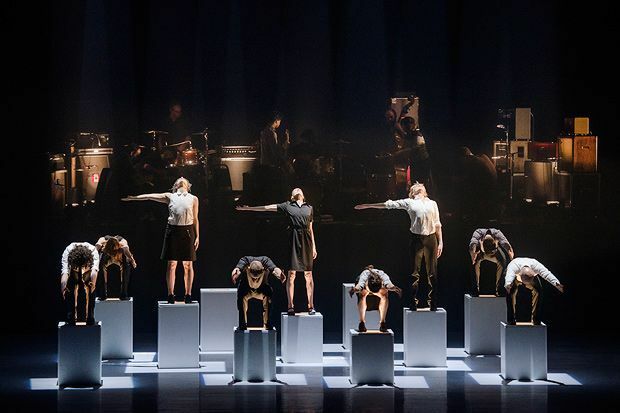 So hats off to the nine dancers in monumental, who spend over 30 minutes performing energetic movement on pedestals, without toppling off. 'The dancers are very intimate with their boxes,' says Dana Gingras, co-choreographer of Canadian dance company Holy Body Tattoo. 'They're on there from day one of rehearsals, because they spend more than half the piece on them – to the point where you want to scream at them to get off. There are lights inside the boxes that sometimes shine up into their faces, so there's a lot of risk. Joining Holy Body Tattoo on stage will be fellow Canadian trailblazers, Godspeed You! Black Emperor, who will drive all this risky movement along with an intense live score that Gingras says, 'goes right into your bones'. Edinburgh Playhouse, 8 & 9 Aug, 8pm, £10–£32.